Duolingo provides free educational resources that will help you learn a whole host of terrestrial languages -- languages like Spanish, French, German, and Italian. But now they're expanding into extraterrestrial languages too, like Klingon. That's, of course, "the constructed language spoken by the fictional extraterrestrial Klingon species in the Star Trek universe. Created by Marc Okrand, the language itself is centered around spacecraft, warfare, and weaponry — but it also reflects the directness and sense of humor of the Klingon culture." 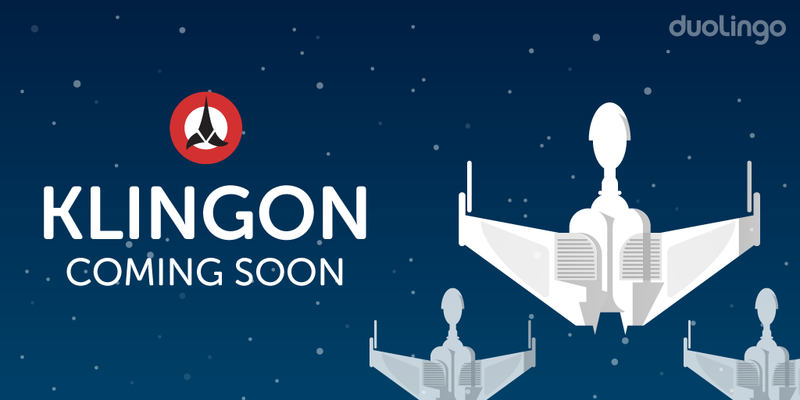 Duolingo's Klingon course -- Klingon for English Speakers -- is currently under development. But, so far, almost 18,000 people have requested to be notified when the course is ready to go. You can add your name to the list here, too. And before you go, make sure you check out our meta list of Free Language Lessons, where you can find free lessons covering 48 different languages. The list includes terrestrial lessons from Duolingo too. I WANT TO LEARN ENGLISH SPEAKING AND SPENISH. What about Vulcan? Did you ever think about that choice? Well, it would be a pleasure leaning that. Live long and prosper! I’d like to learn fluent Klingon in less than a year. Is that realistic?